The demand in the global stretcher chair market is projected to expand at a CAGR of 4.0% during the forecast period of 2017 to 2022, gaining traction from a number of factors such as growing penetration of ecommerce, increasing disposable income among the urban population, rapidly incrementing percentage of geriatric among the world’s population, mushrooming number of specialty clinics, and recent technological advancements, which have made stretcher chairs lightweight, flexible, and a genuine aid for the transportation of the patients. On the other hand, high cost of these products continues to challenge the prosperity of the stretcher chair market in some of the underdeveloped countries. Based on product type, the global stretcher chair market has been segmented into general stretcher chair and special stretcher chair. 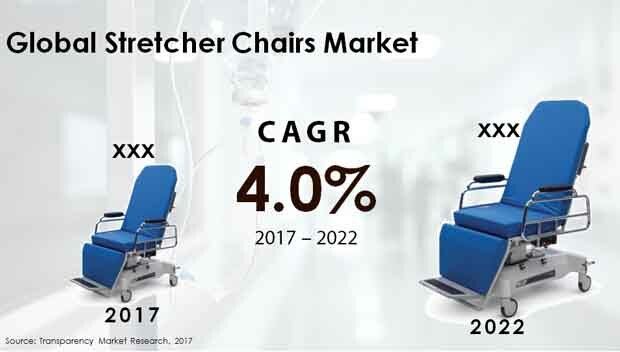 Though special stretcher chairs are customized with additional features, the consumers are currently opting for general stretcher chair, which is the segment that produced 62.6% of the demand in 2017, and is projected to be worth US$151.0 mn by 2022, representing a 60.8% of the total share of demand. The demand for this segment is projected to increment at a CAGR of 3.3% during the forecast period of 2017 to 2022, producing a revenue of US$4.6 mn annually over the said forecast period. On the basis of end-users, the global stretcher chair market has been bifurcated into hospitals, ambulatory surgical centers (ASCs), and clinics. Presently, hospitals serve the maximum demand and are expected to sustain a strong demand for stretcher chair throughout the forecast period. Based on source type, the global stretcher chair market has been categorized into powered stretcher chair and manual stretcher chair. Geographically, the report takes stock of the potential of the stretcher chair market in the regions of North America, Europe, Asia Pacific except Japan (APEJ), the Middle East and Africa, and Latin America, and in the country of Japan. In 2017, Europe accounted for 31.4% of the overall demand in the global stretcher chair market, although the region is projected for a moderate CAGR of 3.8%, which would mean it will eventually lose its prominent position to North America, which on the other hand is estimated for an above-average CAGR of 4.2% during the forecast period of 2017 to 2022. The North America stretcher chair market was worth US$51.0 mn in 2017 and is anticipated to constitute a demand worth of US$62.8 mn by 2022. High adoptability rate of new technology, availability of robust healthcare infrastructure, high buying capability of the citizens of developed countries such as the U.S., the U.K., France, and Germany, and escalating number of geriatrics are some of the key factors driving the European and North American stretcher chair market. Asia Pacific except Japan is another substantial regional market, serving 25.8% of the total demand in 2017, and is expected to gain 20 BPS in its market share by 2022 over 2017. Revenue from the Japan stretcher chair market is anticipated to increase at a CAGR of 3.8% over 2017-2022, to reach US$ 21.5 mn by 2022. The competitive landscape of the global stretcher chair market has a number of participants and most of them depend on differentiating themselves from their competitors by offering innovative products that ideally meet the requirement of the consumers. Some of the key companies currently operating in the global stretcher chair market are: Allengers Medical Systems Limited, Blue Chip Medical Products, Inc., Stryker Corporation, AMTAI Medical Equipment, Inc., CDR Systems, C-RAD AB, GF Health Products, Inc., Elekta AB, Getinge AB, Hill-Rom Holdings, Inc., Invacare Corp, Medtronic Plc., Leoni AG, medifa-hesse GmbH & CoKG, Novak M d.o.o, Skytron llc., Span America Medical System, Inc., OPT SurgiSystems S.R.L., STERIS, and Transmotion Medical, Inc.
Stretcher chairs, used to carry patients from one place to another within and outside of the healthcare center conveniently, are seeing a constant uptick in demand. The constant innovation on the product front has helped boost their uptake. Astute players in the market have been continuously expending money and time on developing better products. As a result, the market has been evolving consistently for a number of decades. The entire value chain in the market is comprised of numerous players ranging from suppliers of raw materials to the manufacturers. The two types of stretcher chairs available in the market are special stretcher chair and general stretcher chair. The general stretcher chairs, at present, are experiencing maximum demand. A recent report by Transparency Market Research studies the market for stretcher chair from different angles to understand its growth trajectory and the factors shaping it. It uncovers the headwinds and tailwinds key stakeholders in the market might likely encounter and also determines their prospects based on an understanding of the competitive landscape. The report collates all the important information after exhaustive primary and secondary research. At the forefront of driving demand for stretcher chairs is the availability of a variety of products having different features and functionalities. For example, there are stretcher chairs that have been designed specifically to carry patients in stairs, corridors, and lifts. The newer products launched in the market are mostly lightweight since they are made from aluminum alloy framework. They also come with improved flexibility and fold-ability. Besides, they can be easily cleaned too. Many are equipped with safety belts for elderly patients. On account of so many USPs of latest products, revenues are being buoyed in the market. A few other factors expected to have a positive influence on the market for stretcher chair is the rising spends on quality healthcare by people, growing pool of elderly, and the increasing number of specialty clinics. The market for stretcher chairs, on the flipside, are being negatively impacted by the high cost of these products, particularly in the underdeveloped countries. Latin America, North America, Europe, Asia Pacific except Japan (APEJ), Japan, and the Middle East and Africa are to name a few of the prominent regions in the global market for stretcher chair. Europe, currently, accounts for maximum demand. Going forward, however, it is expected to lose its share to North America, which will likely emerge dominant vis-à-vis demand. The market in North America is expected to be propelled by the early adoption of latest technologies, a superior healthcare infrastructure, and high spending capacity of people. The U.S. is at the forefront of driving demand in the North America market. Asia Pacific except Japan is another major market. Going forward, Japan too is expected to rake in significant revenue. In order to study the competition in the global market for stretcher chair, the report studies prominent players such as Blue Chip Medical Products, Inc., Allengers Medical Systems Limited, Stryker Corporation, CDR Systems, C-RAD AB, Hill-Rom Holdings, Inc., GF Health Products, Inc., AMTAI Medical Equipment, Inc., Elekta AB, Getinge AB, Invacare Corp, Medtronic Plc., Span America Medical System, Inc., medifa-hesse GmbH & CoKG, Leoni AG, OPT SurgiSystems S.R.L., Novak M d.o.o, Skytron llc., STERIS, and Transmotion Medical, Inc.